Posted On Sun, 25 Feb 2007 04:17:00 +0000. 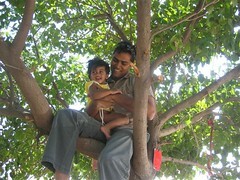 Filed in family, india trip. By Vaibhav Bhandari. Yep! yep!! I have been really bad about pinning down India trip tales! Well now i’m getting to it. My first week was pretty hectic and spent most of the time at Samit’s wedding, followed by hike to Trambakeshwar with Pravin and Gang! The next week was work week, well the think week paper i submitted that week got reviewed and commented my Bill Gates (can you believe that !!). Anyways i made a trip to mumbai in my third week and met with Akshata, Saurabhs parents and the site visits to Asha projects didn’t work out :(. Well in the same trip Vaidehi was welcomed!! The next week and half was pretty hectic celebrating the 1st with a family party and dance, my folks actually danced! woho!! We did a trip to Shirdi and Yeola. A family vacation out didnt work as Sweety got sick, and we didnt have time to plan. Btw, in addition to chilling i did manage to get some workout (I joined a gym - health fitness–?) , a run (did the KTHM Marathon :)..) and lots of rest and good food!!! Well there are many small things i noticed different in India, compared to last year. The westernization has really caught up - my friends are thinking pretty liberal now a days, things are expensive - a small auto ride is alteast 15 ruppees and the growth oppurtunity in terms of job and finance is tremendous!! Now!! you may ask what about marriage, rather what about arranged marriage? Did you hook up?? Ahuh! well this time my parents really made an effort to get me see some gals. Well i’m 28 now and I had made clear that i dont wanna marry for another year but my parents thought may be i’ll change my mind. As a courtesy to a family friend/relative i did see one gal formally but made it clear to her that i’m not interested in it for a year atleast. There were couple of other incidents of matrimony but i think i managed to get out of them!!! I know you might say its time for me to hook up, and i’m not entirely against arranged marriage but hey i want to give a full committe d year to see if i can make a small dent as an entrepreneur and then w’ll think about rationalizing..
That was pretty much a bland travelogue:).. well the next one is about my time in London!! !